It is ironic that the Seahawks and Minnesota Vikings faced off in a college stadium on Sunday because one team on the field certainly played like a college team while the other looked like a serious Super Bowl contender. The Seahawks came into Minneapolis and thanks to strong play on both sides of the ball launched the Seahawks to a runaway 38-7 victory over the Vikings. The Seahawks improve to 7-5 on the season and currently hold one of two NFC wild-card spots. The Vikings fall to 8-4 and hold the other NFC wild-card spot. Here are my brief thoughts on today’s game. Wilson on Point: After throwing 5 touchdowns a week ago, Russell Wilson followed that performance with his most complete game of the season on Sunday. Wilson completed 21 of his 27 passes for 274 yards and 3 touchdowns while also running 9 times for 51 yards and a touchdown. He could have had over 100 rushing yards and a second touchdown but his 53-yard scamper and score was negated by an offensive holding penalty. Wilson’s near-perfect 146.0 passer rating is also his second best mark of the season. Once again this week there was a correlation between Wilson’s production and the protection he received from his offensive line. The line only allowed one sack and Wilson had more than enough time on several of his throws to complete his passes. With the exception of one pass that was a little high intended for Jermaine Kearse, this was also Wilson’s most accurate game through the air. Something just seems to click with Wilson when the calendar turns to December. Rawls Shines Once Again: Another week, another 100-plus yard rushing day for running back Thomas Rawls. His day got off to a shaky start after fumbling on his second carry of the game. Luckily that turnover, the only Seattle turnover of the game, did not lead to any Minnesota points. 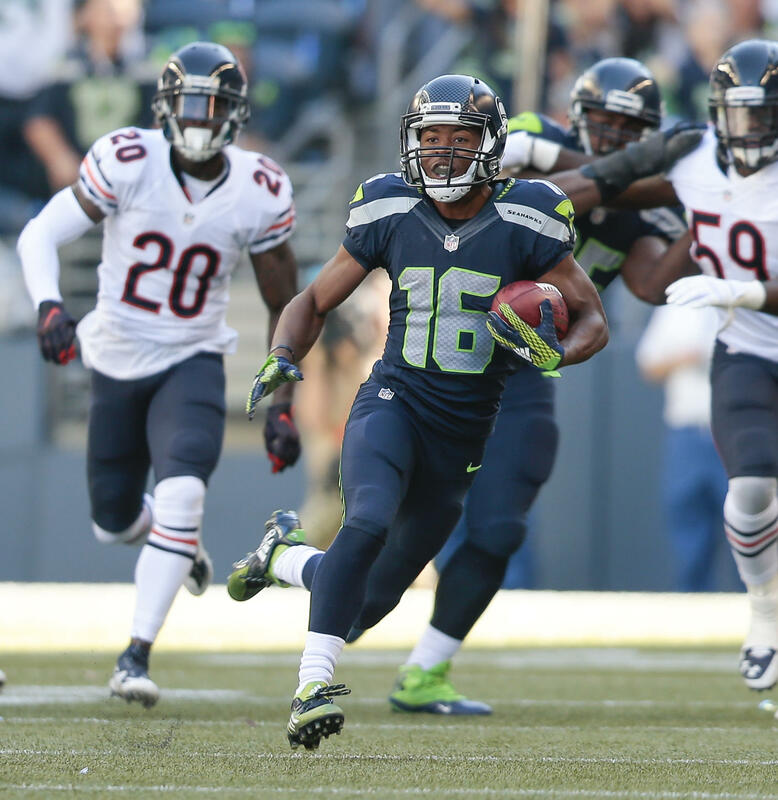 Rawls rode his 5.3 yards per carry average to 101 yards and a touchdown on Sunday. His quickness really seemed to be a problem for the depleted Vikings defense. Here is a number that is sure to surprise Seahawks fans. With 4 games remaining in the regular season Rawls is only 214 yards away from 1,000 rushing yards on the season. During the broadcast they talked about the two-headed monster the Seahawks will have in the backfield once Marshawn Lynch returns from injury but to be honest I think it might be in our best interest to shut Lynch down and ride Rawls for the remainder of the season. That may sound like an absurd idea but the production Rawls has had along with what he is projected to do going forward may not be something head coach Pete Carroll and offensive coordinator Darrell Bevell want to mess with. “Shut Peterson Down, Win the Game”: I wrote about this in great detail in my game preview and this is what I told everyone who asked me my thoughts about this game. The Vikings were only going to be as effective on offense as Adrian Peterson was and the Seahawks shut him down and kept the Vikings offense off the scoreboard. Peterson was held to only 18 yards on 8 carries which are both season lows. The dynamic play of the Seahawks run defense put the game squarely on the shoulders of Teddy Bridgewater and he did not impress whatsoever. With Bridgewater having only thrown 8 touchdowns this season he is the textbook definition of a “game manager” and you could tell that he was struggling to make plays on his own. We took his feet away from him and we flustered him easily in the pocket, sacking him 4 times. By my count Bridgewater was only able to complete two of his throws for 10 or more yards. This was by far the best game our defense has played all season long and to do it on the road against a playoff caliber team should raise eyebrows. Penalty Problem: In the first quarter alone the Seahawks were flagged twice for false starts and once for 12 men in the huddle. This many procedure penalties in one quarter alone is alarming and we had problems with penalties all game long. Luckily the majority of our penalties were small yardage penalties. We had 9 penalties on Sunday, but they were masked by Minnesota’s penalties because the Vikings penalties would come at what seemed to be the worst times including three straight offensive penalties leading to a notable and laughable 1st and 38 opportunity. Mental mistakes have improved greatly over recent weeks but we took a step back on Sunday. Thoughts on Minnesota: Long term the Minnesota Vikings have the talent to contend down the road. Short term may be a different story. The Vikings have a playoff caliber defense but they will only go as far as Adrian Peterson takes them. An offensive outing in a potential wild-card round game like the one they played on Sunday and it will be a quick and ugly one-and-done for the Vikings. With three of their four remaining games against NFC division leaders, it will be difficult for Minnesota to re-claim first place in the NFC North and if they struggle they may have to fight to even earn the #6 seed. Random Thoughts: Although the temperature was said to have been in the high 30’s and low 40’s it looked like people in the stands were miserably cold. Maybe it’s because it was cloudy and looked like it could start snowing… My opinion is the Seahawks will be the #5 seed in the playoffs. With our next 3 games coming against losing teams now is the time to pull away from the rest of the wild-card pack to solidify our spot in the NFL playoffs. What’s Next: The Seahawks will hit the road for their final 10am game of the regular season next week against the Baltimore Ravens. Look for my game preview on Saturday morning. Raise your hand if you had this game as the Seahawks most important game of the season when the schedule came out. After three consecutive games at home the Seahawks hit the road for two straight games. Up first is a huge conference matchup against the Minnesota Vikings. The Seahawks are 6-5 and are coming off a huge win over Pittsburgh a week ago. The Vikings were a team that many experts said to keep an eye on at the start of the season and they are proving the experts right. Minnesota holds an impressive 8-3 record and are currently the leaders of the NFC North. Seattle leads the all-time series 8-5. In their last meeting the Seahawks crushed the Vikings 41-20 in Seattle and the Seahawks eventually went on to win the super bowl. This could very well be a preview of a potential playoff matchup next month. Here is what I will be watching for. The Minnesota defense allows an average of only 17.6 points per game, second best in the league. 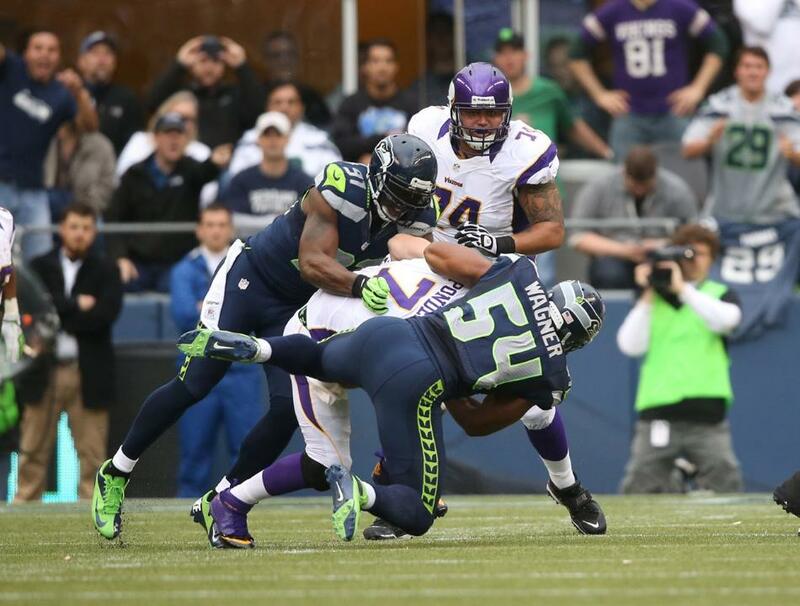 It is imperative for the Seahawks offense to be able to stay on the field and drive deep into Vikings territory. Thomas Rawls will face his biggest challenge of the season and I will be keeping close tabs on his yardage coming on first down opportunities. If he can gain at least 4 yards on first down it will put the offense in a good position to gain first downs and keep drives alive. In the passing game I will be focused on the blocking by left tackle Russell Okung and left guard Justin Britt. The right side of the Vikings front seven consists of lineman Everson Griffen as well as linebackers Eric Kendricks and Anthony Barr. These three players have combined for 14 of Minnesota’s 25 sacks this season (56 percent). I expect Seahawks quarterback Russell Wilson to take care of the ball just like how he did a week ago against Pittsburgh but he must be more aware of his blindside in this game. If Okung and Britt struggle to block it would not be surprising to see Wilson get hit and fumble the ball multiple times. Quick passes to Doug Baldwin, Tyler Lockett, and Luke Willson may be the best way to attack the Vikings through the air this week. If there was one game this season where I wish we still had Red Bryant it would be for this game. Priority number one for the Seahawks defense this week will be to stop Vikings running back Adrian Peterson. It will be up to Brandon Mebane and Ahtyba Rubin to lock down the middle of the line of scrimmage. Given the solid play of Minnesota’s offensive line penetrating the line will be difficult. Good fundamental tackling will go a long way to limiting Peterson’s production. One guy on defense that may see more playing time than usual is Jordan Hill. In an attempt to limit Peterson’s presence it may not be surprising to see Hill, Mebane, and Rubin all play on the line at the same time. The Minnesota Vikings have the top ranked rushing offense in the league. In contrast they also sport the league’s second worse pass offense. At age 30 Adrian Peterson is still as productive as ever and the Vikings offense is only as effective as he is. Peterson leads the league in rushing yards with 1,164 and has rushed for over 100 yards six times this season. The Vikings are 6-0 in those games. My worry is that the Vikings will use other ways to move the ball on the ground in an attempt to avoid throwing towards the Legion of Boom. My X-Factor Player to Watch for the Vikings this week is one of the better young quarterbacks in the league and the man that makes the entire Minnesota offense work, Teddy Bridgewater. Although Bridgewater has not thrown for many touchdowns, he is a very conservative passer who tries to move the ball in small chunks to wear out the opposing defense. Bridgewater has had a completion percentage of over 65 percent in six games. In those games he has thrown only two interceptions. The main reason why he is my X-Factor this week is the threat of him keeping the ball and running. Although he has not nearly put up the type of rushing stats as Russell Wilson or Colin Kaepernick of seasons past, Bridgewater is one of the faster quarterbacks in the league and he will scramble and take off if he feels the pressure and does not have any open receivers. Peterson may be the number one priority of the Seattle defense but Bridgewater also contributes to that top ranked rushing attack. Plain and simple, shut Peterson and Bridgewater down on the ground, win the game. Something that is not garnering the attention that I believe it should is one fairly significant advantage the Seahawks have in this game. Gone are the days of playing the Vikings at the Hubert H. Humphrey Metrodome, which was one of the better home field advantages in the NFL. It would be a tougher challenge for the Seahawks if we were playing at the Metrodome. Instead the Vikings are playing the second of two seasons at TCF Bank Stadium on the campus of the University of Minnesota while their brand new stadium is under construction. The stadium seats just over 51,000 which is the smallest capacity of any current NFL stadium and crowd noise will hardly be a factor. Random Thoughts: The Seahawks will wear white jerseys and wolf grey pants. Seattle is 0-4 all-time in this combination. The Vikings will wear purple jerseys and white pants… Kevin Burkhardt and John Lynch will have the play-by-play and commentary respectively on FOX. Pam Oliver will report from the sidelines… Terry McAulay will be this week’s referee… I briefly considered hitting the road for this game but ultimately decided to go to Dallas instead. The reason behind that decision was the potential weather in Minneapolis. Being a December game I thought there was a realistic possibility of it being below freezing and snowing. Hindsight is 20/20 and in that vein it looks like it will be a nice day for football. The high temperature on Sunday will be in the low 40’s and it will be sunny. That is exactly the kind of weather we have experienced in Seattle the past two weeks… After this week the combined record of the Seahawks next three opponents is 10-23. Translation: If the Seahawks beat the Vikings, you will be extremely hard-pressed to make the argument that Seattle will miss out on the playoffs. Seahawks Playoff Outlook: The Seahawks currently hold the #6 seed in the NFC playoffs and with a win we are locked into this spot for at least another week; we cannot move up but a loss may knock us out of the current playoff picture. Seattle is three games behind the Arizona Cardinals for first place in the NFC West. Here are games to keep track of that may have NFC playoff implications this week. Teams to note are bolded. Prediction: The Seahawks are 12-2 in games played in December with Russell Wilson at quarterback. Each of the prior three seasons our December success has carried us to the playoffs. With the win last week we will be riding some serious momentum into this game. Thomas Rawls will run for over 125 yards and score two touchdowns. Wilson will also throw a touchdown to Luke Willson. The game will come down to Minnesota’s final drive. After a punt by Jon Ryan pins the Vikings at their own 2-yard line, Bridgewater will have to drive 98 yards for a game-tying touchdown. On the first play of the drive Minnesota will be penalized for holding in the endzone, giving the Seahawks a safety and in-turn, clinching the game for Seattle. We will improve to 7-5 and be in the driver’s seat for an NFC wild-card berth. It is a case of déjà vu for the Seahawks this week. Once again we end our regular season at home against the St. Louis Rams and once again a Seahawks win will clinch the NFC West title and home-field advantage throughout the NFC playoffs. The Seahawks are 11-4, winners of their last 5 games. The Rams are 6-9, last place in the NFC West, and are looking to avoid their first double-digit loss season since 2011. The Seahawks lead the all-time series with the Rams 20-13. 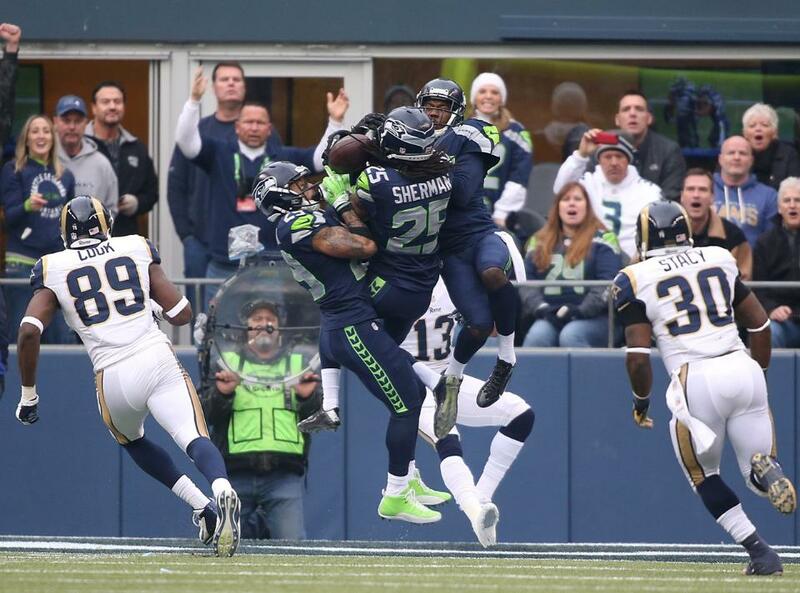 St. Louis’s win over the Seahawks back in October is the only divisional blemish on the Seahawks record. This week the Seahawks and the 12th Man want to ensure the road to Super Bowl XLIX goes through CenturyLink Field. This is what must happen for the Seahawks to avoid an epic upset that could cost us the #1 seed. Overall, I believe both the Seahawks offense and defense ae plenty capable of getting the job done this week. The only way I see Seattle losing is if we beat ourselves which is a big reason as to why we lost to the Rams earlier this season. There are three things we need to avoid doing in order to come away victorious. The first thing the Seahawks must do is not to commit penalties in excessive fashion. Last week penalties were a huge problem especially in the first half. The Seahawks are averaging 8.5 penalties per game and there have only been two games this season where Seattle’s opponent commits more penalties than the Seahawks themselves. If the Seahawks can hold their number of penalties to under their season average we will be in tremendous shape. Specifically, the Seahawks must show they have fixed their problem with procedure penalties. 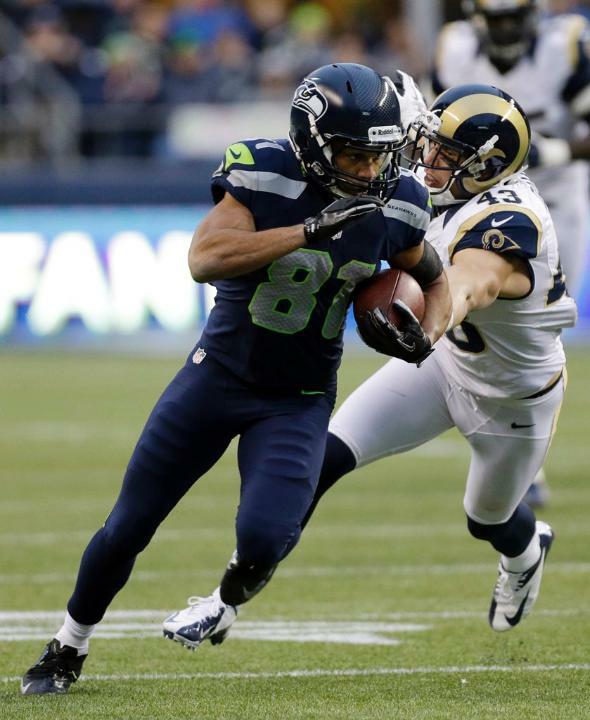 Seattle committed two false starts and two offsides penalties last week. Zero is my target number this week. Anything greater than zero is a failure in my eyes. The second thing the Seahawks must do is not commit turnovers; something they have done an excellent job controlling the past few weeks. During our five game winning streak the Seahawks have turned the ball over only three times. 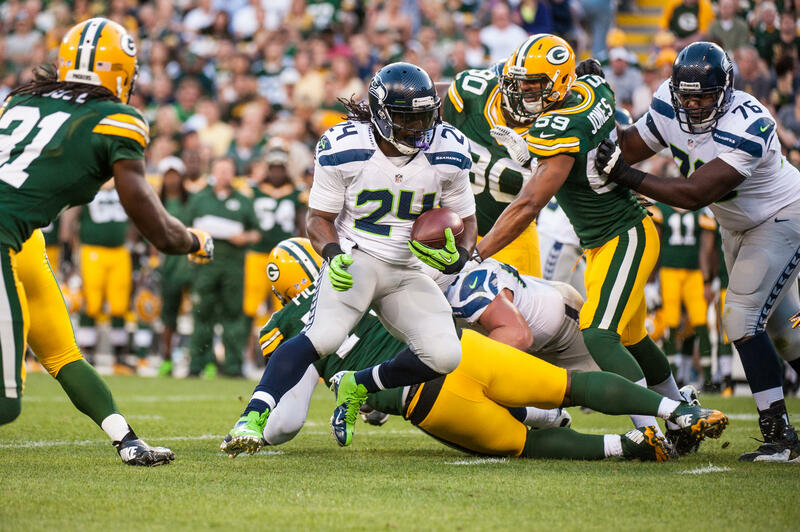 The Seahawks have also averaged only one turnover per game at home this season. Ball security has been a huge strength of this team down the stretch and the Seahawks will absolutely secure a victory if they can continue to not turn the ball over. The third thing, which is the broadest yet the most important thing that must happen, is to avoid major injuries. With the playoffs coming up, the worst thing that can happen is for the Seahawks to lose important pieces of the starting lineup especially on defense. The Seahawks have played as complete of football since the return of middle linebacker Bobby Wagner and the re-emergence of strong safety Kam Chancellor. We are ready to make an impact in January. The only thing that could threaten our hopes of making a deep playoff push is injuries. After watching the St. Louis Rams drop back-to-back games the previous two weeks I am reminded of our matchup against the Arizona Cardinals last week. I say that because of the temporary leader of the Rams offense, quarterback Shaun Hill. After a lackluster game against Arizona two weeks ago, Hill bounced back with a 75% completion percentage and threw for 290 yards, a pair of touchdowns, and an interception in a losing effort last week against the New York Giants. This tells me one thing; Hill is a very inconsistent quarterback where even his best effort is not enough to win. Like Arizona last week, if the Rams have any chance at winning this game it will have to come at the hands of their defense and special teams. The Rams sport a very talented defense with recognizable names at all three levels but my focus this week is on a player who does not get constant recognition. My X-Factor player to watch for the Rams this week is safety T.J. McDonald. Not many Rams defenders do multiple things really well but McDonald does a very good job getting to the ball carrier to make tackles and also does a good job tracking the ball in the passing game. McDonald ranks third among all Rams in tackles with 98 on the season. McDonald also gets to the quarterback when safety blitzes are dialed up, recording two sacks this season. In the secondary McDonald has seven passes defensed and one interception. I do not expect the Seahawks to air the ball out consistently this week so I expect McDonald’s biggest impact to be getting to the ball carrier. If McDonald can force a Seattle turnover it is possible that St. Louis can keep this game close. Random Thoughts: Seahawks in all blue, Rams most likely in all white this week… Gus Johnson and Charles Davis have the call for FOX this week. This is the first and only NFL game Johnson and Davis call this season, as they normally are FOX’s number one broadcasting crew for college football. For those of you unfamiliar with Gus Johnson’s broadcast style you are either going to be wildly entertained or wildly annoyed. His nickname is “screamin’ Gus” for a reason. Just type his name in on YouTube and you’ll understand what I’m talking about. I would love to hear a Gus Johnson call of a long Marshawn Lynch touchdown this week… We have played the Rams at home in week 17 four out of the past five seasons. Hey NFL, how about we switch the schedule up next year… Going to switch it up before the game. Pyramid Alehouse for lunch and perhaps a beer at Safeco Field before heading into the stadium. Looking forward to Pyramid’s fish and chips… The Seahawks are giving away “We Are 12” t-shirts at the gates this week. I hope they look cool. We’ll see if the Seahawks encourage the fans to wear the shirts or to use the shirts to wave like towels… The postseason schedule will likely be announced at halftime of Sunday Night Football between Cincinnati and Pittsburgh. As excited as I am for the Seahawks game, I am almost more excited to see when and at what time the Seahawks will play their first playoff game. I am hoping we get to play on the Sunday of divisional weekend instead of Saturday like last year… Barring an epic collapse my hope is to be down at the Seahawks Pro Shop after the game getting my Seahawks 2014 NFC West champions gear just like last year! Seahawks Playoff Outlook: A Seahawks win gives us the NFC West title and virtually guarantees we clinch the #1 seed in the NFC and home-field advantage throughout the playoffs. The only way the Seahawks do not earn the #1 seed with a win is if the Lions/Packers game ends in a tie. If the Seahawks lose and the Cardinals lose, the Seahawks will still win the NFC West but could earn the #1, #2, or #3 seed depending on what Detroit, Green Bay, and Dallas do on Sunday. A Seahawks loss and a Cardinals win would give Arizona the NFC West title and the Seahawks will be the #5 seed. Here are Sunday’s games with NFC playoff implications. Teams to note are bolded. Detroit (11-4) at Green Bay (11-4): The winner of DET/GB wins the NFC North and clinches the #2 seed in the NFC. The loser clinches the #6 seed in the NFC. Prediction: The Seahawks know what is at stake and they will not let anything prevent them from winning this game. Marshawn Lynch will score a pair of touchdowns and Russell Wilson will also throw for a pair of touchdowns. For the second straight week the Seahawks will not allow a touchdown and the Seahawks will coast into the playoffs as the 2014 NFC West champions. Seattle will wrap up the #1 seed in the NFC and will take a week off before getting ready to play either Atlanta, Arizona, or Detroit in the NFC Divisional Playoffs. Check back late Sunday night as I review our regular season finale against the Rams. I will also take a first look ahead to the NFL Playoffs and who I believe the Seahawks will face in their first playoff game. Enjoy the game and Go Seahawks!